In 21st century, the advanced society should be improved the quality of life and be sustainable in considering the disaster mitigation and the environment. To achieve this goal, in this laboratory, various research topics are studies and researched, that is, the technology to create space frontier in the subsurface, the advanced approach of the geo-sequestration of energy byproducts of radioactive waste and anthropogenic CO2, advance science and technology of mechanical and hydro mechanical behavior of geo-material, environment friendly and safe urban freight transport systems and management for logistics systems. Estimation of mechanical and hydromechanical properties of jointed rock masses. Development the constitutive law considering the mechanical and hydromechanical behavior of jointed rock masses. Development of a coupled inversion technique of deformation, stress and pore pressure and its application. Multi phases fluid and geomechanics simulator. Estimation of earth pressure on the ground excavation. Estimation of mechanical behavior of the pre-cast arch culvert and its application. While considering performance of radioactive waste disposal system and CO2 Geo sequestration, it is necessary to examine hydraulic properties of rocks near the facility in detail, because thermo-hydro-mechanical-chemical (THMC) processes may be active under such conditions. In this laboratory, a long-term rock permeability change is predicted by developing a THMC numerical model that considers pressure dissolution at grain contacts in the rock. Then, the influence of pressure dissolution is examined by comparing calculation results with and without pressure dissolution. In considering the excavation of tunnel and underground cavern, stability of rock foundation and slope, the mechanical and hydro-mechanical behaviors of rock masses are clarified. The mechanical and hydro-mechanical behaviors of rock masses are strongly affected by the mechanical and the hydro-mechanical properties of joints/fractures. In this laboratory, the fundamental laboratory experiments such as direct shear test and triaxial test are carried out and the constitutive model are estimated. Multi-agent model consists of many agents in an environment and each agent acts autonomously based on their knowledge, goal, skill and plan. Four agents are considered as important stakeholders to the urban freight transport, freight carriers, shippers, administrators and residents. The multi-agent model is developed to evaluate effects of freight transport activities and urban freight policies such as road pricing, traffic regulation to trucks and load factor control. Some performance measures considered in this model are the environmental improvements in urban areas and surrounding areas and change of costs and benefits for freight carriers and shippers. Decisions on goods distribution and freight transport have typically been made looking over an entire supply chain network (SCN). 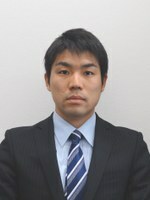 Therefore, accurate comprehension of what happens on the SCN, namely, to precisely describe the behavior of economic entities in the SCN and the resulting flow of products (and of raw materials as well), allows administrators and planners to understand the mechanism of the generation of goods movement as well as to investigate the effects of logistics-related measures. 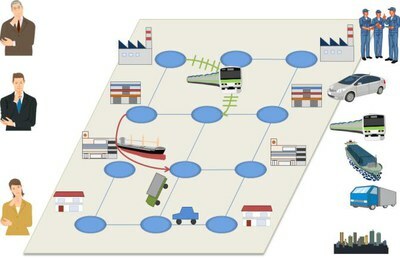 This research aims at developing mathematical models (i.e., supply chain network equilibrium models: SCNE models) to comprehensively illustrate what comes about in the entire SCN, where the behaviors of manufacturers, wholesalers, retailers, consumers (i.e., demand markets) and freight carriers are described. The models can estimate the amount of products produced by manufacturers and transacted between the entities involved in the SCN, and the price of products. There is a possibility of the SCN entities and traffic conditions on a transport network (TN) influencing each other’s behaviors, since products are moved through the TN. This research also attempts to develop supply chain-transport supernetwork equilibrium (SC-T-SNE) models. 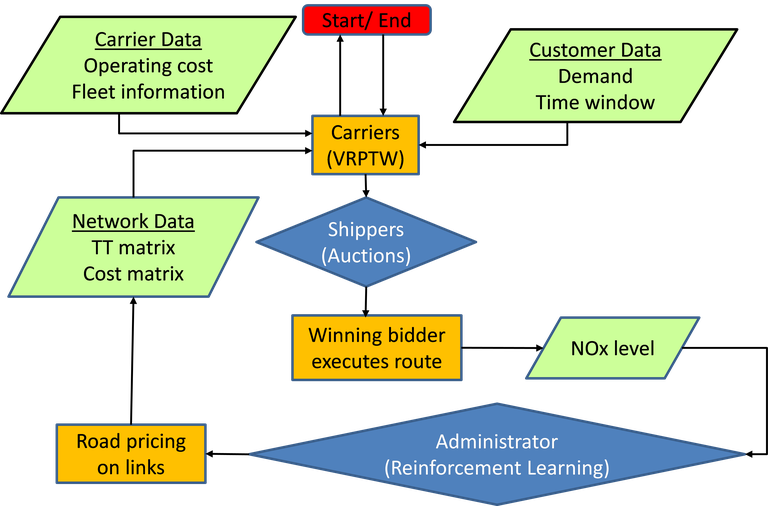 With the behavior of TN users being incorporated, the models allow for endogenously determining transport costs based on freight carriers’ decision-making, as well as for investigating mutual effects between behavioral changes in the SCNs and the TN. The models also have the potential to facilitate the optimal transport network design considering SCN-TN interaction in terms of efficiency and/or resiliency of the supernetwork.